This page describes Kubernetes DaemonSet objects and their use in Google Kubernetes Engine. Like other workload objects, DaemonSets manage groups of replicated Pods. However, DaemonSets attempt to adhere to a one-Pod-per-node model, either across the entire cluster or a subset of nodes. As you add nodes to a node pool, DaemonSets automatically add Pods to the new nodes as needed. DaemonSets use a Pod template, which contains a specification for its Pods. 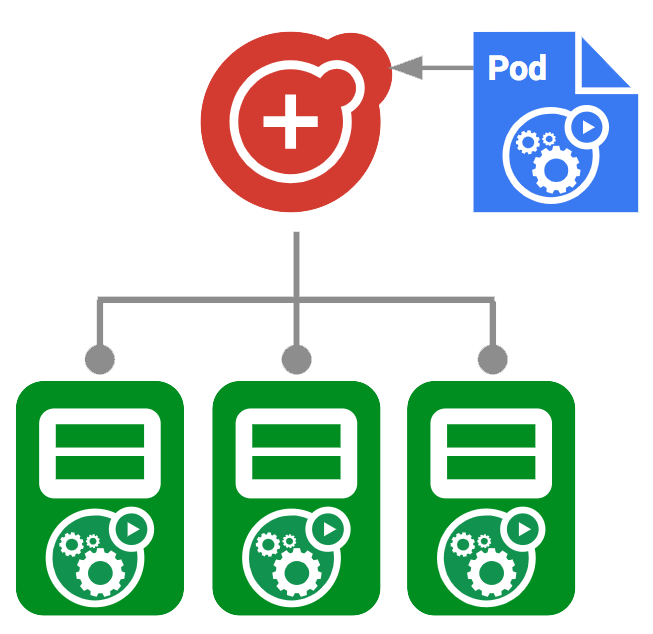 The Pod specification determines how each Pod should look: what applications should run inside its containers, which volumes it should mount, its labels and selectors, and more. DaemonSets are useful for deploying ongoing background tasks that you need to run on all or certain nodes, and which do not require user intervention. Examples of such tasks include storage daemons like ceph, log collection daemons like fluentd, and node monitoring daemons like collectd. For example, you could have DaemonSets for each type of daemon run on all of your nodes. Alternatively, you could run multiple DaemonSets for a single type of daemon, but have them use different configurations for different hardware types and resource needs. You can create a DaemonSet using kubectl apply or kubectl create. A DaemonSet named fluentd is created, indicated by the metadata: name field. DaemonSet's Pod is labelled fluentd. A node label selector (type: prod) declares on which labelled nodes the DaemonSet schedules its Pod. The Pod's container pulls the fluentd-elasticsearch image at version 1.20. The container image is hosted by Container Registry. The container requests 100m of CPU and 200Mi of memory, and limits itself to 200Mi total of memory usage. Run fluentd-elasticsearch at version 1.20. Request some memory and CPU resources. For more information about DaemonSet configurations, refer to the DaemonSet API reference. You can update DaemonSets by changing its Pod specification, resource requests and limits, labels, and annotations. OnDelete does not automatically delete and recreate DaemonSet Pods when the object's configuration is changed. Instead, Pods must be manually deleted to cause the controller to create new Pods that reflect your changes. RollingUpdate automatically deletes and recreates DaemonSet Pods. With this strategy, valid changes automatically triggers a rollout. This is the default update strategy for DaemonSets. For more information about updating DaemonSets, refer to Perform a Rolling Update on a DaemonSet in the Kubernetes documentation. Read more about DaemonSets in the Kubernetes documentation.